To implement a straightforward workflow that allows to establish augmented reality (AR) support in spine surgery. Intraoperative computed tomography (iCT) applying a 32-slice movable scanner was used for navigation registration in a series of 10 patients who underwent surgery for extra- or intradural spinal lesions. Preoperative multimodal image data were integrated by nonlinear registration with the iCT images. Automatic segmentation was used to delineate the 3-dimensional (3-D) outline of the vertebra, and in addition, the tumor extent, as well as implants, was segmented and visualized. Automatic patient registration without user interaction resulted in high navigation accuracy with a mean registration error of only about 1 mm. Moreover, the workflow for establishing AR was straightforward and could be easily integrated in the normal surgical procedure. 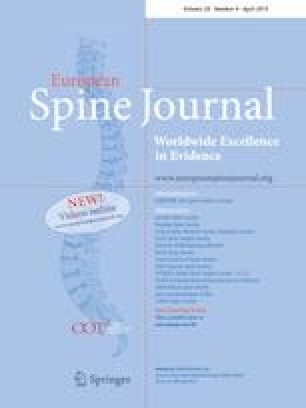 Low-dose iCT protocols resulted in a radiation exposure of 0.35–0.98 mSv for cervical, 2.16–6.92 mSv for thoracic, and 3.55–4.20 mSv for lumbar surgeries, which is a reduction in the effective radiation dose by 70%. The segmented structures were intuitively visualized in the surgical field using the heads-up display of the operating microscope. In parallel, the microscope video was superimposed with the segmented 3-D structures, which were visualized in a semitransparent manner along with various display modes of the image data. A microscope-based AR environment was successfully implemented for spinal surgery. The application of iCT for registration imaging ensures high navigational accuracy. AR greatly supports the surgeon in understanding the 3-D anatomy thereby facilitating surgery. The online version of this article ( https://doi.org/10.1007/s00586-019-05969-4) contains supplementary material, which is available to authorized users. We would like to thank J.-W. Bartsch for thoroughly proofreading the manuscript. B Carl, M. Bopp, B. Saß and B. Voellger declare that they have no conflict of interest. Ch. Nimsky received speaker fees from Brainlab.